I had a conversation on Facebook the other day about original sin and its relationship to non-duality. I thought it was a great discussion, and I thought I’d share it again here. I had a conversation on Facebook the other day about original sin and its relationship to nonduality. I thought it was an excellent free-form discussion, a dialogue to dive into deeper understanding about these topics and their relationship. I thought I’d record the thread here to share it again more broadly. I thank my friend Ben Heaton for engaging with me in this conversation, for bringing up some interesting angles and ideas, and for allowing me to share our discussion again here. The original sin was thinking we were separate. Ben: I think that calling it a sin oversimplifies it and for most people probably relates it to a narrower definition of sin. I believe that the Adam and Eve story is symbolic of the bringing on duality into the world, and that it has a purpose, and happened as it was ordained to. We can’t understand nonduality if we have never experienced duality. We should see them each for what they are. But I do believe that what happens for most people is that they get completely stuck in the duality part. 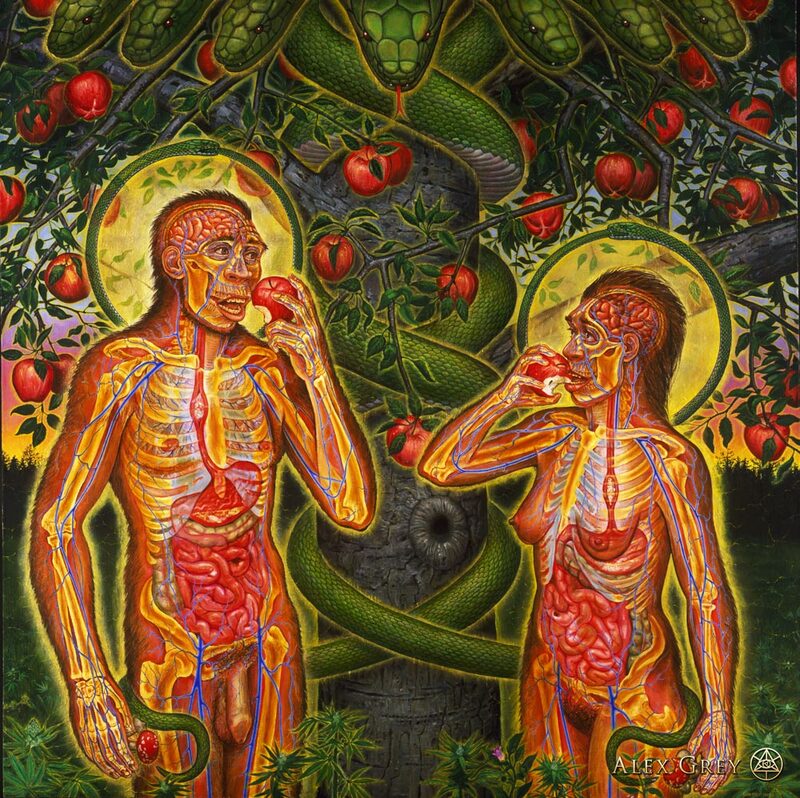 Bryce: I agree that Adam & Eve represent the onset of duality in humanity, which I think was essentially the recognition of self as a separate subject in the world. That’s where we got the subject/object split in the human mind. I’m the subject, all else is object. But it’s a false split, I perceive. I am not, in actuality, separate from all the objects in the world. I’m one with them all. Even the very dust of the Earth becomes my body, continually. We are all part of the same continuum of being on this planet and in the universe. What makes me think I’m separate is my recognition of my subjective point of view. I see I’m here, and all else is out there. But what if we didn’t recognize this subjective view? What if all was object? Or all was subject? There would be no perceived separation. It’s just the perception of subjective separation that makes us believe in duality. Most other animals don’t seem to have the perception of a separate subjective self. They are not aware that there is a self that is separate from the rest of creation. They seem to simply act in the world, as a part of the world. They don’t seem to continually worry about this thing called self. Perhaps this is why Jesus said we should be more like animal and plant life. And he said unto his disciples, Therefore I say unto you, Take no thought for your life, what ye shall eat; neither for the body, what ye shall put on. The life is more than meat, and the body is more than raiment. Consider the ravens: for they neither sow nor reap; which neither have storehouse nor barn; and God feedeth them: how much more are ye better than the fowls? And which of you with taking thought can add to his stature one cubit? If ye then be not able to do that thing which is least, why take ye thought for the rest? Consider the lilies how they grow: they toil not, they spin not; and yet I say unto you, that Solomon in all his glory was not arrayed like one of these. If then God so clothe the grass, which is to day in the field, and to morrow is cast into the oven; how much more will he clothe you, O ye of little faith? And seek not ye what ye shall eat, or what ye shall drink, neither be ye of doubtful mind. For all these things do the nations of the world seek after: and your Father knoweth that ye have need of these things. But rather seek ye the kingdom of God; and all these things shall be added unto you. Perhaps it is our desire to try to understand nonduality that keeps us from experiencing it. Perhaps we keep eating from the Tree of Knowledge of Duality, thinking this will bring us back to the Tree of Life. Ben: I agree with the above, it seems to apply most to what we should now do in our current situation. I just think that the words “original sin” make it sound like it should never have happened. Maybe ” in the beginning” there was a nondual singularity, which created duality to better understand itself, for child-like curiosity, or for reasons that we don’t understand. Although duality is an illusion, it was not a mistake that it was created. Now that we are in duality, our task is to see through the illusion and return to nonduality. But there is no huge rush for this. The universe has patience. Look how many billions of years it took to get to these few thousand years of humanity. To a universe that spent millions of years playing with dinosaurs, we don’t all now have to get to nonduality this week. Maybe the universe still has a lot more to learn from duality. It is good to spread teachings about nonduality and to help those individuals who are ready. It will all unfold in time as it is supposed to. Bryce: Yes, “original sin” is not something that should not have happened. It’s just what happened. But it is often the cause of deep suffering. When the egoic self can’t find pleasure, or can’t avoid pain, then it suffers, not having what it wants. It can’t accept reality as it is. It also often harms the true Self, which is all other life and the world, not realizing that it is all one and the same in God. It seems to all go back to this separate sense of self. The self creates the illusion of duality, and it is our goal to see through that illusion, which is really the illusion of a separate independent self. People will suffer, and the world harmed, until we can see through the illusion, until we repent of this sin, returning to nonduality, realizing our oneness in God. Hence religions’ perennial call to repentance, liberation, and awakening to reality. This seems to be an imperative for many mystics, prophets, sages. Yes, it doesn’t have to happen this week, but the sooner the better. We don’t want this global Second Coming to wait until the world is too far gone that it is irredeemable, and we seem to be headed in that direction with things like climate change. Christ comes to save humanity from its self. May the oneness of Christ come, and come quickly! Ben: What do you think is the purpose of duality, why was it instituted? Bryce: Just like “original sin” is not something that should or should not have happened, so with our perception of duality/self. I don’t think there was a preconceived purpose or goal in it. I think it may have been a natural stage of our evolution and increasing complexity of consciousness. At some point, hominids became aware of their “selves” as separate isolated beings in the world. I think perhaps the next stage in our evolution is fully realizing we are not separate beings, even all of life and the world is not separate and independent, but are manifestations of a much greater interconnected Whole, a One. Ben: I agree that from a purely secular viewpoint duality would have no preconceived purpose or goal for duality, because like everything else, it would have appeared through random mutations. From a spiritual perspective, as in the Adam and Eve story, it seems that it had to be preconceived and goal oriented. Without duality there would be no such thing as nonduality. Just as there would be no such thing as good, since there was no evil. No right, because there was no wrong. I get the impression that you think that we would have been better off if there had never been duality, and good and evil. Only a nonduality that we would have no comprehension of. Bryce: Duality is an illusion. It’s not real. It’s a perception of things that is not ultimately true, so it is a false perception, a delusion. I believe we were not asked to believe that which is false. Rather it seems to be the natural result of our evolution to date to believe it, but seeing through delusion and error is how we progress. There are not many different separate things, but rather many manifestations of the same one wholly interconnected and integrated thing. We think that good and evil are two separate and distinct things. We seek the good and reject evil, believing that perhaps one day there will only be good, and the duality will be gone. But that’s not nonduality, it seems to me. Good can’t exist by itself. There must needs be an opposition in all things, or there is no God (2 Nephi 2). Good and evil exist along a single spectrum, are the poles of that ONE spectrum. One doesn’t exist without the other, not because we have to perceive duality for them to exist, but because they belong to the same thing. They are manifestations of the same ONE thing. Nonduality doesn’t mean there is no more good and evil, light and darkness, sweet and bitter. It means we see and know these things as necessary manifestations of this one existent universe. Just like the head and tail of a dog are not two different living things, but are the pole ends of ONE living thing. The illusion of duality will be seen through when we realize that reality is one integrated whole being expressed along a myriad of spectrums. At times we can clearly perceive through the illusion directly, the veil is lifted, and we see the underlying oneness of reality. We see that we too are wholly a manifestation of this one reality, and perceiving this directly this is the atonement; we see we are fully one in God. Ben: I agree with what you are saying but am trying to add some caveats to continue this deeper. I agree that duality is an illusion and a delusion. But it is also real in the sense that this illusion is a real phenomenon that we experience in mortality. I would say that it relates to the veil of forgetfulness that we are all born into. It seems in our discussion that there may be two types of nonduality that relate to Ken Wilbur’s “pre-trans fallacy”, in that as we as we develop child-like qualities in our progression, we do not return to be a baby (pre), but we develop these qualities in a more advanced adult state (trans), which are not the same thing. In this sense it seems that there was one state of nonduality in which we had never know duality, and another state of nonduality which occurs after we have experienced duality and then put it all back together again, which is the process which I believe that you are mostly focusing on now. Regarding what I said above about “two types of nonduality”, I realize that this is an oxymoron. As Phil McLemore says, the greatest truths are often paradoxical, and are difficult to articulate due to the limits of our language and perceptions. I mean that for arrangement’s sake, there appear to be two different aspects or colors of nonduality that may help us to understand nonduality in a deeper way. The language of the first half of life and the language of the second half of life are almost two different vocabularies, known only to those who have been in both of them. The advantage of those on the further journey is that they can still remember and respect the first language and task. They have transcended but also included all that went before. In fact, if you cannot include and integrate the wisdom of the first half of life, I doubt if you have moved to the second. Never throw out the baby with the bathwater. People who know how to creatively break the rules also know why the rules were there in the first place. They are not mere iconoclasts or rebels… if a person has transcended and included the previous stages, he or she will always have a patient understanding of the juniors, and can be patient and helpful to them somewhat naturally (although not without trial and error). That is precisely what makes such people elders! Higher stages always empathetically include the lower, or they are not higher stages! I think this works well with my thoughts. When we are an infant, or prior to our development of self-awareness in our human evolution, we had a nondual view of existence. There was no subject (self), all appeared as object (a nonduality of sorts). Our object-ives were mainly finding food, mating, and avoiding death, and most animals today spend most of their time seeking these main objects. But they don’t seem to know or recognize themselves as an individual separate from the environment and other individuals (or it is a very limited and simplified self-recognition). When we developed self-awareness, or recognized ourselves, the subject/object split was introduced, and duality seemed to enter our perspective in full force. We began to perceive and distinguish the many polarities of existence, believing them to be separate and distinct things/objects. Not only are there all these objects out there, but there is a subject too—myself. The goal in life became to protect and grow the self, to seek happiness and avoid pain in the self. This transcended and included the prior viewpoint, of the need for food and mating, but added the need to care for this localized self, my body, my ego, my happiness, my tribe, my family. As we progress more we come to realize that duality is an illusion, even the sense of a separate self is an illusion, and that all things, including the subject and object, and all duality spectrums, are really manifestations of one greater wholeness, which is reality and the universe. We realize we are not separate from the universe, but are aspects of the universe, in the universe. We are inseparable from it, wholly interconnected to it. We are one and the same thing as the universe. We see the Self encompasses much more than this localized body. It includes all of life, on this planet and throughout the cosmos, and even all of creation, wherever it has materialized in the whole of the universe. All things become Subject (a better nonduality). The goal in life becomes living life as Life itself, and helping all other life awaken to this oneness with what it is—Life. This is why Jesus said that he was the Way, the Truth, and the Life. He identified with the whole of Reality and Life, the exact same way we may also identify with this One. This is what I think Jesus hoped we would do, and many others have taught it as well. And this Life is perceived as Perfect in its true nature, even Innocent and Pure, Whole and Complete, like a little child. This transcends and includes the prior viewpoint, of the need to care for the localized self/family, but adds the greater perspective of the Oneness of all of Life and Reality, and to care for the true Self and Human Family and Creation. I believe our current Fallen perception of duality, and of a separate subject and object, is the result of a natural evolutionary process of life and consciousness in the universe. The Universe/Reality/Law, as “Adam and Eve,” awoke on Earth not knowing anything, “forgetting” all, becoming even as a little child, not even knowing what it was. It was perfectly innocent and pure. As life and consciousness develop it gradually learns things. It comes to perceive itself as a separate subject, a self, many selves, all separate and isolated into separate bodies. It comes to see things out in the world as good and bad, right and wrong, up and down, light and darkness, sweet and bitter. It eats of this Tree of Knowledge of Duality which has real repercussions in its life, including deep suffering, being bombarded by both the good and bad, not able to perfectly grasp the good or escape the evil. It only wants one end of the spectrum, not realizing that when you grab hold of one end, the other must come with it. When you grasp the friendly rattle tail, you get the snake’s head too. Life comes to realize that all truth is circumscribed in one great whole, that there must needs be an opposition in all things, both ends of the spectrum. If you cut off one end of a spectrum, it still has two ends. There are always two sides to a coin, but it remains just one coin. And so life realizes that it is part of something much greater than its small self. It is only a single manifestation in this greater thing we call Reality/Universe/Law. It comes to know that each body, each self, each life, are as waves in the ocean, not separate, but One with the greater Whole, emerging from and returning to this One. The veil is lifted, and we come to remember what we are as this One in God, the Incarnation of this Universe/Reality/Law. This is the nonduality that I think we are headed towards, that we are being called towards. I don’t think it was preconceived or planned out prior to it happening. I don’t think there was anything like a high council meeting among the Gods who decided that this is the way it was going to happen. I think that is an ancient mythology that attempts to describe this Reality using symbols that were familiar. God is this Reality that is happening right now. We live in it, move in it, and exist in it (Acts 17:28). The Universe did not exist before it existed, I perceive, and I don’t think God transcends the Universe, or sits outside of it. God is the Universe, it is the Source of our creation, and all of Creation, it seems to me. And we exist in it, as It. The Universe wakes up and eventually comes to know itself, as a mirror in a mirror reflects itself from eternity to eternity. I perceive that God is the Universe in its entirety, the whole of Reality, and the Eternal Law that proceeds from this, which, of course, includes ourselves. The end of the creation of the Universe is for it to realize what it is, for the veil to be lifted from itself, and for it to see itself and know itself and then to live as itself as fully and as completely as possible in Love and Light. We might call this God’s wisdom, purpose, power, mercy, justice, and many many other things. But that is just because it is what we call it, being Gods in God, our egos trying to understand it, to label and categorize it in our rational dualistic minds. God is all that is happening now, as it is happening, as a natural result of the Law that proceeds from itself, I perceive. So no, it wasn’t chance, per se; it was the natural result of the Law of God, which is one and the same as the Law of the Universe. I agree this can often seem paradoxical to our limited rational consciousness, and is very difficult to articulate in finite language. I certainly don’t think I understand it or can explain it all perfectly. This is a good discussion. Thank you, Ben, for the thoughts and questions and insights. I know you may not agree with some of the things I’ve said, but your questions do help me to articulate my views hopefully in a way that is helpful, and I learn from you as well. I think I may turn this into a blog post, unless we want to continue the discussion. Some of these thoughts I’ve also shared on my website where I discuss evolution. Ben: I will just throw in some extra thoughts as I read your post. In my view, it is hard to really know what animals experience. They certainly have a sense of self in that they know to eat another animal rather than their own leg. I’m not an expert, but I believe that many species seem to know who is or isn’t in their clan. With limited language to communicate, I think its hard to draw any definite conclusions on what . And what about Neanderthals,etc, where would they fit in? Another item, Sam Harris in his recent podcast on Buddhism, said that in losing the sense of self, that everything becomes an object rather than the subject. He says that losing the sense of self is more advanced than a feeling that everything is me (the subject). This may be a more Buddhist perspective. Bryce: Yes, it is hard to know what animals experience, and there are many studying that even now. I think it might be safe to assume that they don’t have nearly as complex a perception of self and the world as we humans do, particularly the further away we go in relationship to humans. If they did, then we would probably be competing with them on a more level playing field. A worm most likely has a very limited understanding of its body and of the outside world. It seems to act from much simpler natural instincts and urges rather than anything that could remotely be called introspection or reasoning. Neanderthals, on the other hand, are much more closely related to us, and so their sense of self and the world seems like it may have been much more similar to ours, perceiving duality in the world, and a subject/object split. They may have also been “fallen” in this way, in the same way we are. But they did not survive. Will we survive? I don’t think the survival of Homo sapiens sapiens into the distant future is a foregone conclusion, as many people seem to think. Humanity is not invincible. I listened to that podcast too. It was a great discussion. Sam Harris comes from a very secular point of view most of the time, and doesn’t seem to like anything that may even hint of traditional conceptions of God. Saying that all becomes object is just a different way of saying that all becomes subject. He seems to privilege the sense of “non-duality” over a sense of “oneness,” but I think these may just be a general difference between the way that mystics of East and West have tended to characterize their experiences. I don’t think one is necessarily better than the other, or more advanced, or more correct. And even within Eastern thought, particularly Hinduism but it may even be found in some schools of Buddhism such as the Thai Dhammakaya, that say that the Self is all things, the realization of one’s true self is Atman, and that this is identical with Brahman, or that Buddha-nature in nirvana is the realization of the True Self. I would ask Sam Harris this: When we lose the sense of self, and all is perceived as object, what is perceiving? Is the object perceiving? And if so, doesn’t that make it in some sense also a subject? Perhaps we should say that subject and object collapse into one thing, not either-or, but both-and, into one subject-object, or object-subject, a subjective object or objective subject. Ben: I do agree mostly with your last post, I thought you brought together these ideas nicely. Another consideration that I have been thinking about is how how our physical body and its natural instincts are part of the veil, and thus part of the illusion. For example, we may experience nonduality in meditation and in present moment awareness, but then if someone attacks us, our body’s adrenaline kicks in and we respond with the fight or flight mechanism, and we are back in the duality. This is a more extreme example, but I think that we are all born with different natural genetic personalities and we can modify somewhat, but we will always be somewhat at the mercy of our physical brains and our biochemistry. Another example is of the many gurus who have had mystical experiences and are great teachers who then fall into sexual impropriety. This relates to Phil McLemore’s idea that we cannot perfect the natural man, but must disregard it or “crucify” it. I hope this makes some sense, but I feel it relates to what we are discussing about duality because while we are still alive in our mortal bodies, it seems that we still have to deal with duality, even as we have glimpses and experiences of nonduality. There’s a lot to think and about and to experience. Bryce: Good thoughts. I think our egoic mind is essentially the veil, and this extends into our body. The sensations of the body can become part of the egoic mind, particularly when the ego identifies with the body. I think the “natural man” has little to do with the physical body itself, and more to do with the ego, with the psychological self in our mind. Often ascetics have used mortification of the body in order to subdue their ego, and we can even find such practices in Mormonism, such as fasting, kneeling during prayer, and in hard physical service. There are many mechanisms, I perceive, that may use the body to subdue the ego. And the ego can also use the body to aggrandize itself, to seek pleasure, and to avoid pain. I’m not sure if we can ever entirely escape the ego, or even if we should. But I do feel that we should try to become fully aware of our ego, of its lies, its delusions, its illusions, and how it often tries to control us and others. When the ego is crucified, then we see it for what it is, an illusion, a construction, and we realize it is not who we really are. This never leaves us, but can be obscured by time, which is why we need continual communion. Our identity goes much deeper and broader than the ego. That’s why the ego is often called the “small” self, while the true Self is seen to be much larger, even cosmic in reach (the nondual Self). I believe Jesus saw his ego crucified on many occasions, and realized his true Self, which is Christ. I think the symbolism of baptism, of transfiguration, of Gethsemane, of the cross, of atonement, and the temple are all pointing to this crucifixion of the ego/natural man. I think this is what Jesus was teaching others to also realize. I think it was what Joseph Smith was teaching. I think other teachers, such as Siddhartha Gautama, were also teaching something very similar, to realize one’s Buddha-nature. It seems to be a common pattern found around the world, and throughout history. Ben: The more I study, the more I am finding it difficult to separate the ego from the body. Back to Sam Harris, he argues and offers evidence that free will does not exist. While I am not ready to completely accept this, it becomes clear that our will is not as free as we naturally think it is, when we look at it from a brain-based view. (I’m just finishing Harris’s book Free Will, a great short read.) Another thing I have been thinking about is our evolutionary instincts, how they may be related to both good and bad behaviors, and how this might be related to concepts like the Light of Christ or the idea of Satanic evil or of the mortal illusion/delusion that we have been talking about. I haven’t come to any conclusions, may have to mull over this for a long while. This all gets back that to the point that I was trying to make initially in this post that duality may be THE defining aspect and experience of mortal life. Glimpses of nonduality can be very helpful and may offer a pathway to a higher level, but duality is so ingrained into our evolutionary neurophysiology, that we shouldn’t expect massive changes any time soon. Some individuals may make a lot of progress, but changes in society will take time. Will the future see further biological evolutionary change? Genetic engineering? Medical solutions or use of entheogens? Or just old-fashioned meditative enlightenment one person at a time? Will further spiritual growth occur in higher heavenly realms, or through rebirths? I try to keep an open mind. Bryce: Yes, I agree that our will is not as free as we think it is (I’ve read Harris’s book too). I tend to agree with the compatibilists that what we are really concerned about is whether we have freedom to act according to our proclivities.without hindrance. But even without free will in the traditional sense, I think we may still have an ego, a psychological self that we think we are, and this seems to me almost entirely mind-based, or at least that is where it registers. We identify with all of the thoughts that arise in our mind, believing we are those thoughts and feelings, both the originator and owner and thinker of those things. We think we’re the CEO. This, I think, is the ego. It’s when we identify a “self” that is the owner and doer of all of these thoughts and feelings, and part of losing that ego-self is in detaching from those thoughts and feelings, in breaking the identification with them. It’s in realizing that we’re not the originator of those thoughts and feelings. They just arise naturally, of their own accord. We are really something more fundamental, more basic, more universal, perhaps even consciousness, awareness, or life itself. We’ve talked a little about evolutionary instincts, and I won’t say much more about that, but I think it is revealing how Jesus talks about the birds and the lilies. I think he is indicating that something in our evolution has become out-of-whack with the natural order, and this is the cause of much suffering. That something is this sense of being a CEO, of having an ego-self to worry incessantly about, believing we have ultimate control when the reality is far different, in my opinion. I agree that duality is often the defining characteristic of our lives today. We are currently hard-wired to perceive things mostly dualistically. But I think this is changing. One of the main theses of Richard Bucke’s 1905 book Cosmic Consciousness is that humans are evolving out of this dualistic phase, we are beginning to awaken to a greater sense of wholeness, holism, of oneness. I tend to agree with this, and I want it to come. I think it may be a similar view of Ken Wilbur, Richard Rohr, Teilhard de Chardin, Sam Harris, and many others. And I think we are seeing rapid changes. Even though we may still need to act in the world in many dualistic ways, I believe this doesn’t prevent us from regularly seeing through that illusion to the truer wholeness that exists underneath it. Mirages may appear on the horizon, but we know that there is not really water there. Optical illusions make it seem that there are moving lines, but we really know that there is not movement. I think that we can continue to operate in a world that seems dualistic on the surface, and yet come to know at a very deep level that the world is not dualistic, that there is an interconnected wholeness throughout that manifests in many ways, and at times we can witness this ever more directly and vividly. I think there are many wholesome and beneficial implications for being able to perceive this wholeness, and I think many are coming to realize this as well. It is good or society. I see many means in development and on the horizon that may facilitate our perception of this wholeness, this oneness, beyond contemplation/meditation, including through innovative engineering, design, pharmacology, brain stimulation, mind training, tools for flow states, etc. Joseph used seer stones. Maybe he used entheogens too. Maybe Jesus did as well. Maybe even Moses did (I’ve seen some studies suggest that cannabis may have been an integral ingredient in the ancient holy anointing oil, which would seem to make the stories of visionary-mystical-divine experiences in the tabernacle/temple make much more sense). I think these will all be part of our ongoing conversation and evolution to higher stages of understanding and higher states of oneness consciousness. I also try to keep an open mind. Ben: Well put! I think that is is easy to see the ego as an entity separate from the body on a theoretical basis. In the day-to-day lived experience, I think that this distinction sometimes becomes murkier, and its harder to see where one ends and the other begins. Perhaps this is the nature of the illusion. But the conception of ego is definitely helpful for spiritual growth and self-realization. As you mentioned earlier, I think that writing and sharing my thoughts helps me to clarify and organize my thinking and brings new questions to my mind. It’s all very interesting. Next postWhat is Religious Experience For? Pingback: The Evolution of Ego in the Allegory of Adam & Eve – Thy Mind, O Human!